In the morning I’m always looking for something quick to make for breakfast before I head out to the office, mind you, I am normally out the door by 6:30am. So, for me, this has to be something that’s simple to make and can travel well because at that time in the morning my stomach just has not quite woken up yet nor do I have the time or desire to sit down (or stand up) to eat anything. The only thing have before I leave the house is my delicious cappuccino that my husband makes for me (more on that on another post!). 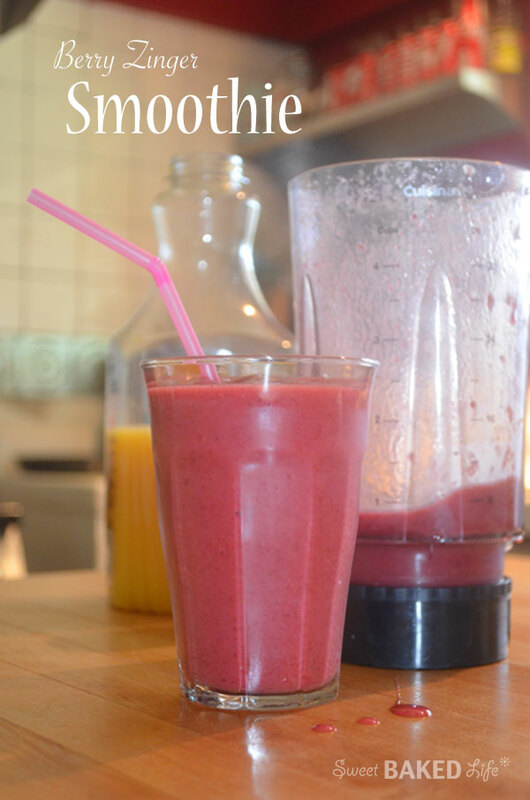 So this quick and easy Berry Zinger Smoothie is a great go-to breakfast for me. After I whip it up, I put it into a to-go cup, pack it in my insulated lunch bag and by the time I get to work, it’s still frosty and simply delicious – and by then I’m absolutely ready to get something in my stomach to begin my crazy day! Pour juices and fruit into a blender. Blend on high speed until everything is well incorporated. If you like your smoothie thicker, add more fruit or a few ice cubes or if you like your smoothie thinner, add more orange juice ¼ cup at a time until you reach the consistency you want. Have a great day — now get ready to conquer the world with this tangy Berry Zinger Smoothie!